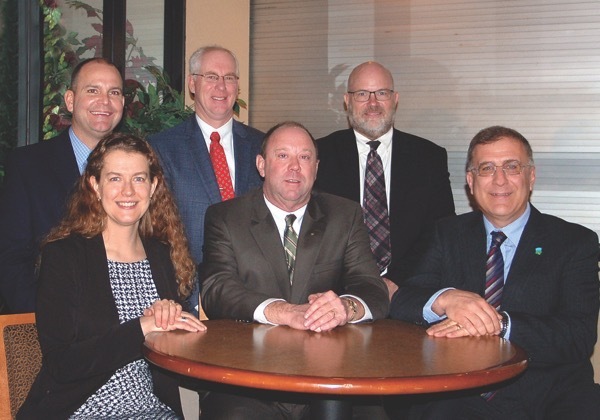 The new ISPFMRA leadership team was elected at the organization’s 91st Annual Meeting held February 7 in Decatur, IL. Robert Woodrow, AFM, front, center, is elected as 2019 President of the Illinois Society of Professional Farm Managers and Rural Appraisers. Woodrow is a principal with Farmland Solutions, LLC, Sherman, IL. To his right is the organization’s Academic Vice President Dr. Maria Boerngen, Illinois State University, Normal, IL. To Woodrow’s left is newly-elected Vice President Timothy Harris, AFM, with Capital Agricultural Property Services, Princeton, IL. From left, standing, are: President-Elect Seth Baker, AFM, Field Level Agriculture, Inc., Mt. Zion, IL; Immediate Past President Daniel Legner, ARA, Compeer Financial, Princeton, IL., and; Secretary/Treasurer Gary Schnitkey, Ph.D., University of Illinois, Urbana, IL.